RCA Victor 1882. Xavier Cugat. The King Plays Some Aces (1958) LP. Tracks include Oye Negra, Danse des Mirlitons (from the Nutcracker Suite), Carioca, Night Must Fall, Linda Mujer, Cuban Mambo. 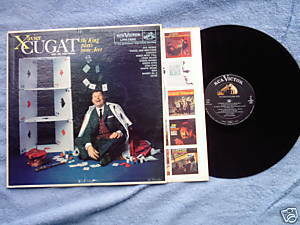 Liner notes by Xavier Cugat himself. produced by Fred Reynolds. Vinyl is VG; cover with photo and sketch by Cugi is VG with some scuffing on front and back; inner sleeve features images of other RCA popular albums.